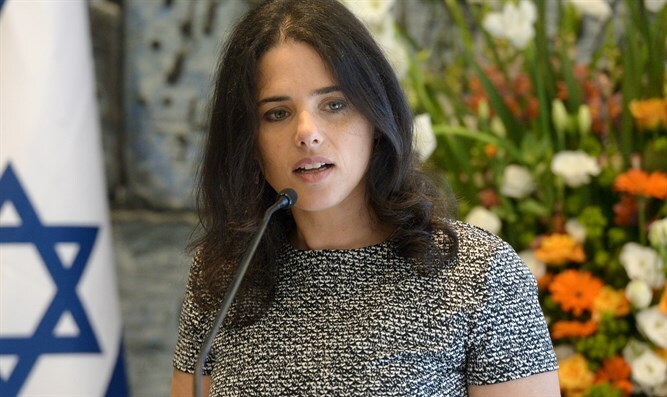 Justice Minister Shaked slams Meretz Tel Aviv list for warning about religion, haredim voting. Justice Minister Ayelet Shaked, who lives in Tel Aviv, received the same message other residents received, from the Meretz faction running in Tel Aviv. She was surprised to find her own name on the message. In response, Shaked wrote on her Facebook account: "Well, it turns out that the Meretz faction in Tel Aviv is a bit under pressure, the campaign is not taking off, so the members there went through a scare campaign. Now they also say that there is 'religionization' in Tel Aviv and that the haredim will flock to the polls." "Religionization in Tel Aviv? Are you serious? Who exactly made this town haredi - Ron Huldai? His deputy Assaf Zamir? What is included here, a demand to hold a separate marathon? "The facts about Tel Aviv are of course backwards, but why not incite hatred between sectors, if it can bring some votes? And why not introduce me as a demon, if it wakes up the dormant Meretz activists? "I was born in Tel Aviv. The streets of this city are the landscape of my childhood. I grew up in this wonderful city and I raise my children, where my parents grew up. I am not observant, but I have respect for those who are. I am connected to the Jewish heritage of our people and when a famous artist who lives in Tel Aviv recently told us how sorry he was that at the kindergarten of one of his children, the candle lighting ceremony on Friday was stopped, because two activist parents claimed that it was 'religionization,' I realized that if there was a problem in Tel Aviv, it is not 'religionization,' but the hatred of anyone who represents the religious and the traditional. And when my friend told me that the school principal decided not to uphold the school's Torah acceptance ceremony in the neighborhood synagogue, as it's been in the city for 100 years since its inception, I realized that the fear of intimidation worked, and I told her: fight for the truth," Shaked wrote. "In the elections to the city council, I will vote for Haim Goren, a teacher who was a councilman on behalf of the south city faction. He takes care of everyone, is honest and good. And to Meretz, I say: Look for another sucker to raise a negative campaign on her back and arouse your activists."